We already love Giggle for their amazing selection of modern and trendy baby and kid products, which includes a many eco-friendly items too. Now the site is jumping on the flash sale bandwagon with their very own daily deals GiggleDEALS, making them the first retailer to launch their own flash sale site. Every day brings a new deal featuring great Giggle-picked brands at prices up to 70 percent off. Trendy clothing, modern baby gear, nursery furniture, eco-friendly toys, and more will all be up for grabs in these new must-shop super sales. Creating a green nursery and finding modern decor for kids isn’t always the most affordable endeavor, so we’re thrilled that GiggleDEALS will help fuel our passion for cool, well-designed, sustainable stuff. Read on to find out how to get access to these insider discounts. So what sets GiggleDEALS apart from the rest of the parent-focused daily deal emails you’re receiving? 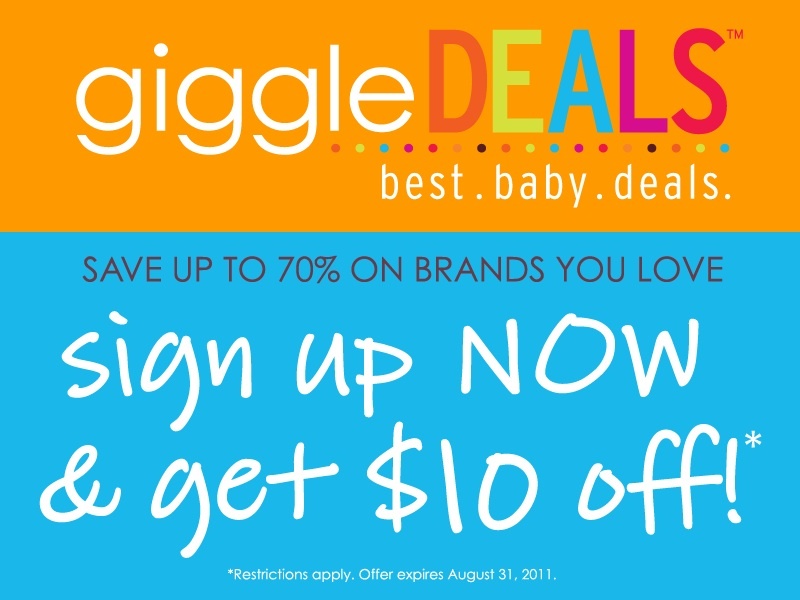 GiggleDEALS often features brands who have never done flash sales before and the products featured will be the same brands you know and love typically found on Giggle. When you sign up for GiggleDEALS you’ll receive a daily email and get access to three amazing discounts to choose from every day. Recent deals have included Zutano organic baby clothing, green sprouts Feeding Frenzy, Vipp pails and the Nano High Chair by Bloom. Right now you can save $10 off your first order. Plus, you can save even more by referring a friend — when they make a purchase, you’ll get $10. You won’t get stuck with exorbitant shipping costs either because Giggle often offers discounts to get the goods to you including free shipping on orders over $75. Check out GiggleDEALS this week for savings on Mimi the Sardine Fun & Friendly Bags, Stella Cove Beachwear and Petunia Pickle Bottom Gift Sets. We already love Giggle for their amazing selection of modern and trendy baby and kid products, which includes a many eco-friendly items too. Now the site is jumping on the flash sale bandwagon with their very own daily deals GiggleDEALS, making them the first retailer to launch their own flash sale site. Every day brings a new deal featuring great Giggle-picked brands at prices up to 70 percent off. Trendy clothing, modern baby gear, nursery furniture, eco-friendly toys, and more will all be up for grabs in these new must-shop super sales. Creating a green nursery and finding modern decor for kids isn't always the most affordable endeavor, so we're thrilled that GiggleDEALS will help fuel our passion for cool, well-designed, sustainable stuff. Read on to find out how to get access to these insider discounts.